Becoming a makeup artist online can lead to a career in the fashion industry. If you're looking for a way to turn your love of beauty and aesthetics into a career, consider becoming a makeup artist. Makeup artists work in various capacities, providing beauty services to models, celebrities and people attending special events. A number of schools offer online courses that can help you begin a career as a makeup artist. Online makeup artistry schools use online modules and email correspondence to instruct and assess students. 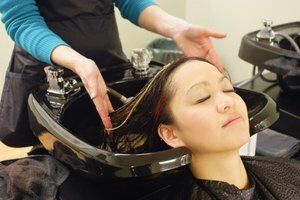 Most courses focus on a certain style of makeup for a given period of time, guiding students in learning the processes and techniques involved in achieving the specific look. Students are evaluated on their understanding and application of makeup styles and techniques through quizzes and before-and-after photos they email to instructors. The pace of instruction varies between online makeup artistry schools. Some courses are accelerated and can be completed in a few weeks or months, while others allow students to work at their own pace as long as they finish within a certain amount of time. The price range for online makeup artistry schools varies depending on the program's depth and scope. Basic programs start around $350, but more in-depth programs can cost up to $3,000. One online makeup artistry school offers an advanced course of study that involves 150 hours of work and costs close to $9,000. Most online schools include makeup and brush kits in the cost of tuition, and some give students the option to buy deluxe kits at an additional cost. Online makeup artistry schools provide instruction on a wide range of makeup styles. Makeup artistry students learn application techniques and tips on styles including bridal and wedding, runway, high-fashion editorial, fantasy and theater makeup. 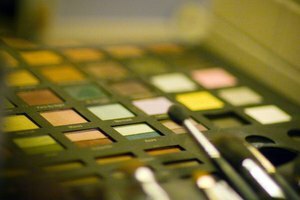 Many online schools teach students about the business aspects of makeup artistry, such as developing a portfolio, set etiquette and attire and how to set rates. The HEX Makeup Artist School provides a certificate for classes taking place over a two-week period. Students complete an intensive course of study that focuses on areas such as runway, bridal and wedding, photography and high-fashion editorial makeup. The National Online Makeup Academy offers students a six-month course of study that allows them to earn a makeup artist certificate recognized throughout the industry. Based in Canada, the Artists Within Makeup Academy offers an online option where students are given up to a year to complete a four-module course of study at the pace of their choosing. Lawrence, Carissa. "Online Makeup Artistry Schools." Synonym, https://classroom.synonym.com/online-makeup-artistry-schools-23109.html. 26 September 2017.